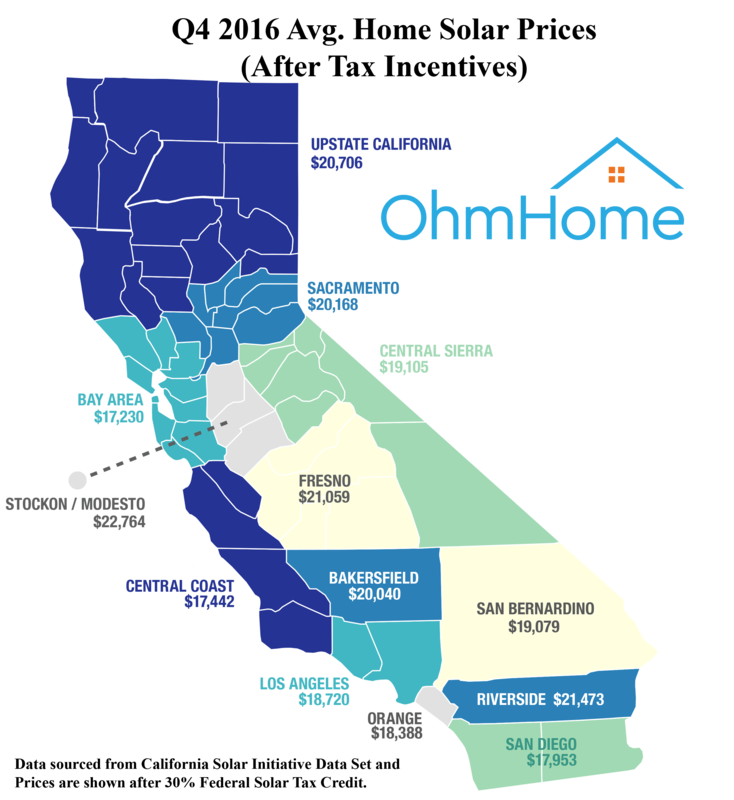 OhmHome‘s California Solar Index, which tracks new solar permits in major markets, declined 41% in the first quarter of 2017 from the same period in 2016. The decline is partially due to the record rain in California in January and February, but March activity was also down 41% from the prior year. The downturn in California, the largest solar market by a wide margin in the U.S., has likely contributed to the recent turmoil for the larger residential solar installers. Verengo Solar: Filed for bankruptcy in November of 2016 and sold assets to Crius Energy for $11 million. Verengo’s headcount reached 1,000 in 2013 and it was one of the top residential solar installers. The company’s troubles may have begun as early as 2014 when it reportedly attempted a sale. NRG Home Solar: In May 2014, NRG had acquired Roof Diagnostics, one of the largest residential solar companies in the U.S. at the time with nearly 500 employees. After several restructuring attempts, the company finally shutdown the majority of its solar operations. OneRoof Energy: In July 2016, OneRoof announced that it was winding down its solar operations after a change in strategy in May of 2016. The company had announced its “Solar 2.0” strategy in which it moved away from traditional direct sales in favor of a channel strategy. In March, the company announced the sale of residential solar assets to Greenbacker Residential Solar for $8 million in cash. OneRoof Energy was backed by Black Coral Capital. Tesla/SolarCity: The company announced in a Q4 shareholder letter that it will be reducing customer acquisition spend and shifting from leases to purchases (a broader market trend). Enphase Energy: Enphase announced a strategic investment in early 2017 and a strategy change. The company’s stock has dropped from $15 in mid-2015 to $1.28 currently. Sungevity: Sungevity, which had an “asset light” business model, filed for bankruptcy in March. Spruce Finance: The company is reportedly for sale with rumors of layoffs and executive trouble. The residential slowdown in California is primarily driven by two factors: (1) high solar penetration in major solar markets and (2) changes in net metering that have made the financial case for homeowners less attractive. Solar penetration, defined as the percentage of single family homes that have solar, exceeded 7% in California at the end of 2016 and exceeded 10% in certain areas (15% in San Diego). The turmoil in the residential solar market has presented a buying opportunity for consumers, as solar prices (defined as the lower quartile of the distribution curve) reached $3.66 per watt or $2.56 (after federal tax incentives). The average cost of a solar system in California is approximately $19,000 after tax incentives. The price decline is a result of an increase in supply in the module market and increasing installer competition, as illustrated by the events listed above. At these prices, solar can make an attractive investment in many states with cash returns exceeding 15% in New York, California and Massachusetts. With the S&P reaching record highs, a solar system could be a very attractive investment relative to common stocks in the next 12-18 months.